Before anything -> go enter my Giveaway <- it will end in 3 days! Naruko Narcissus Total Defense Fundamental Serum may be the most versatile serums of the many offerings from Naruko. 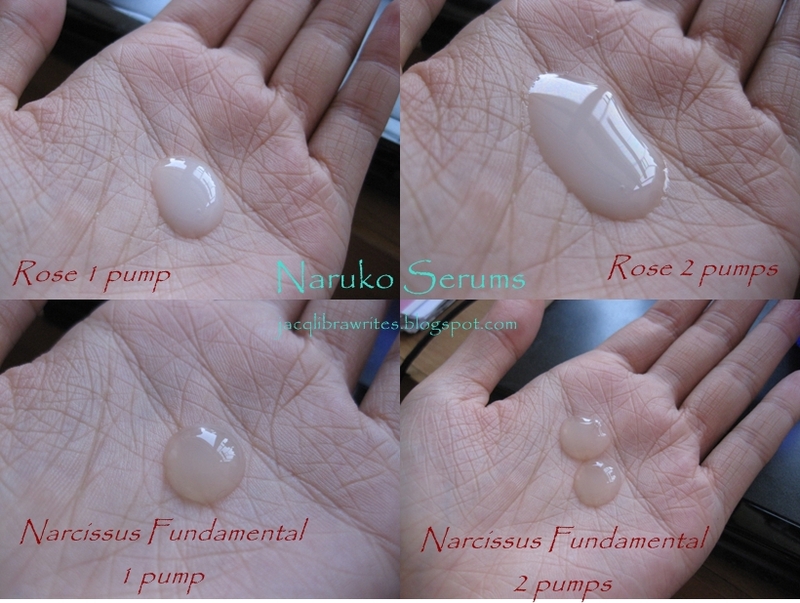 This is meant to be basic (the 'entry' product line of Naruko is Narcissus Total Defense), and good for layering -- meaning if you want more whitening you can add another raw job's tears serum on top, or for oil control: a tea tree serum for example. Let me began by quoting from the US website, again, I can't agree 100% with their translation/interpretation but still helpful to some of you, hopefully. 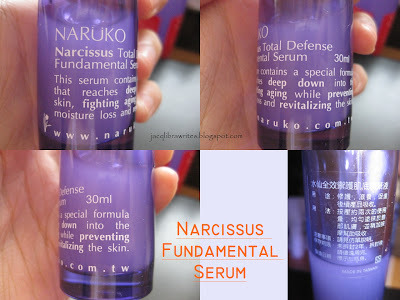 NARUKO Narcissus Total Defense Fundamental Serum is a fundamental care product that delivers hydrating, vitalizing and anti-aging benefits. It readily absorbs and improves skin from inside out, resulting in a healthier looking appearance and stronger defense. It is recommended to use the product within 6 months of opening. Apply to skin after using lotion. Pump 1-2 times to dispense a dime-sized amount (around 0.5ml) to palm. Spread and massage on face thoroughly. You may wipe, pat and press for better absorption. Follow with moisturizer and eye care. When the bottle contains 1/10 or less of the serum, it’s recommended to pour the serum right out of the bottle instead of using the dropper. PACKAGING : 1/5 *Although sanitary, I don't like their dropper design. This is put under the day-time routine on the Taiwan website now, but I have used this morning and night. As a beauty blogger suggested, when used under other skin care and serum especially, this facilitates the absorption and layers very well as a base. I do agree with the good layering part but I can't comment much on the absorption, as I don't have issues with product absorption with my skin... It smells beautiful and natural (almost like raw flower juice you obtain by smashing real petals, very fresh), and has an amazing cooling and calming feeling on the skin. I love this stuff and I will definitely repurchase this to be layered under my other serums -- but this shall be done after my Project 20 Skin Care AND after Naruko re-package this into the pump dispenser! :P I feel like a little challenged doing the dropper thing every day and night. Hehe. For people who like light serums or like layering skin care products. Fresh-floral scents lovers will adore this. Yes if they change their packaging. Note: I have 1 back-up of this. I'm sure you can find my email somewhere on this blog if you want to contact me that way! What a list of various blogs came up when I googled your comment! It must be a very interesting spam!??? What do your words mean in common English actually?